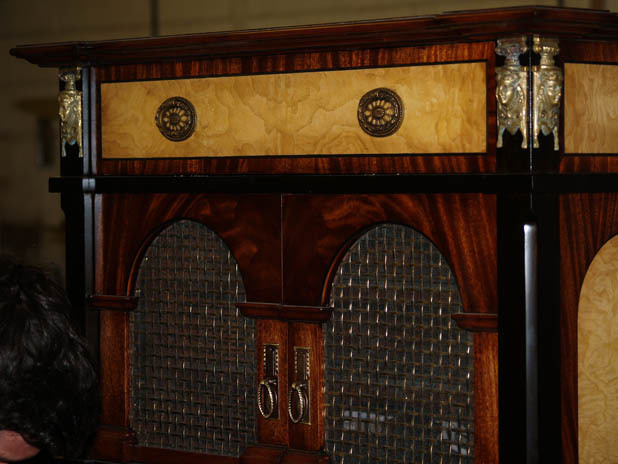 A stunning and unique hi-fi cabinet in an Arabesque style. 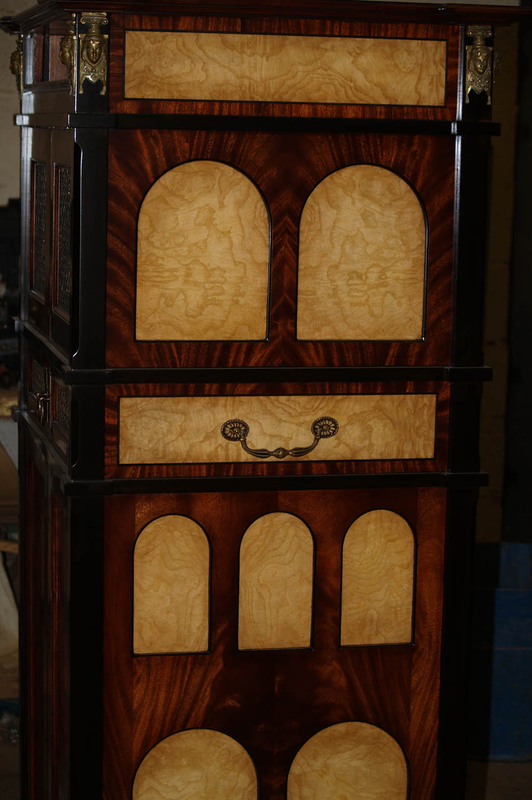 Finished in an unusual Burr Ash with figured mahoganies book-matched and cross-banded, offset Ebonised pilasters and brass Ormolu mounts. 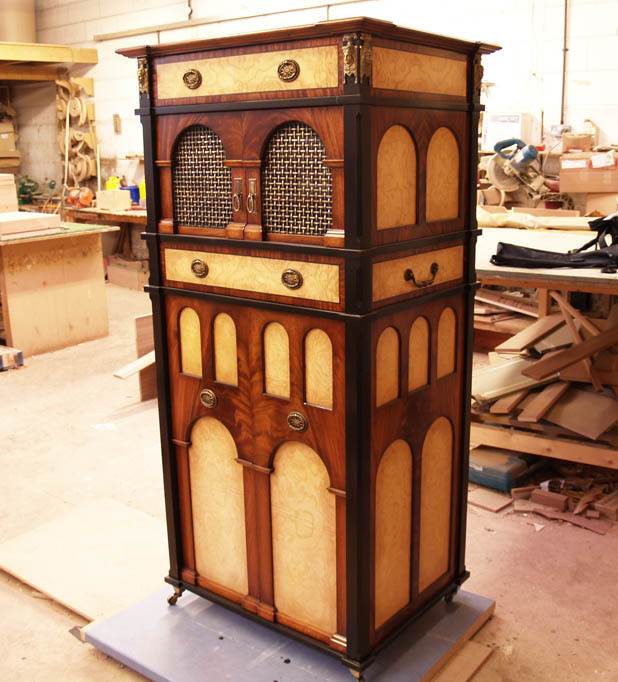 This three sided unit housed an entire CD collection along with the Hi-Fi equipment and could be moved from room to room. 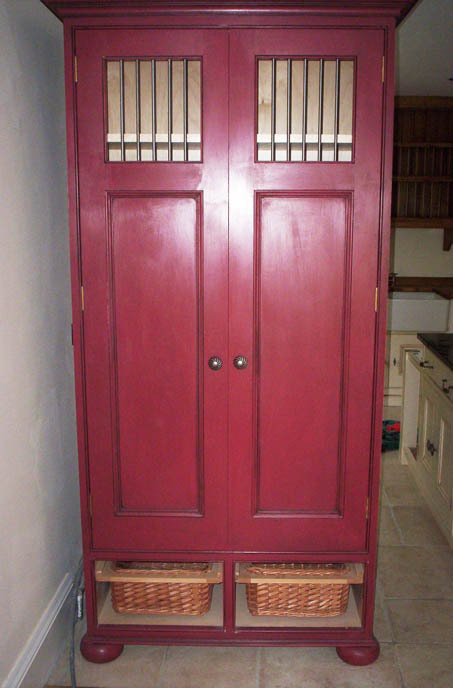 Unit comprising of drawers and cupboards which help, rather than hinder, the over-all design of the piece. 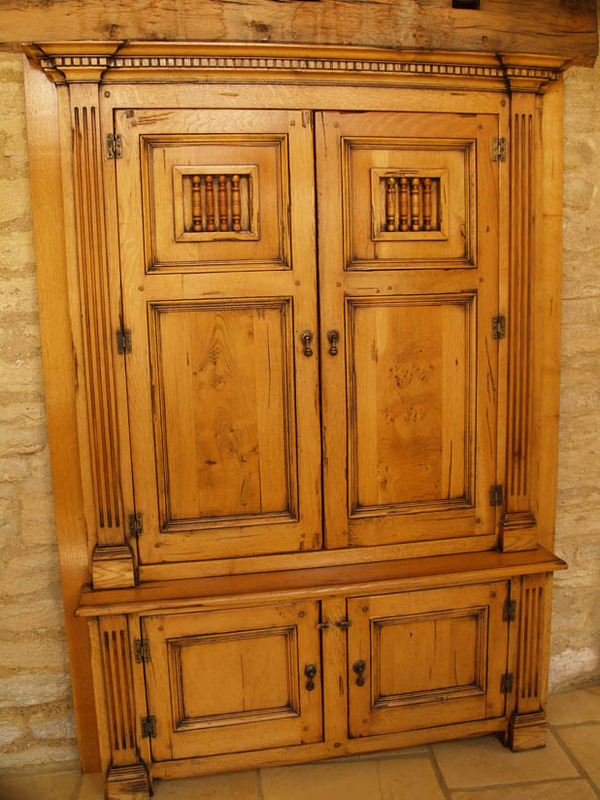 An Oak wall cupboard with 17th Century detailing. 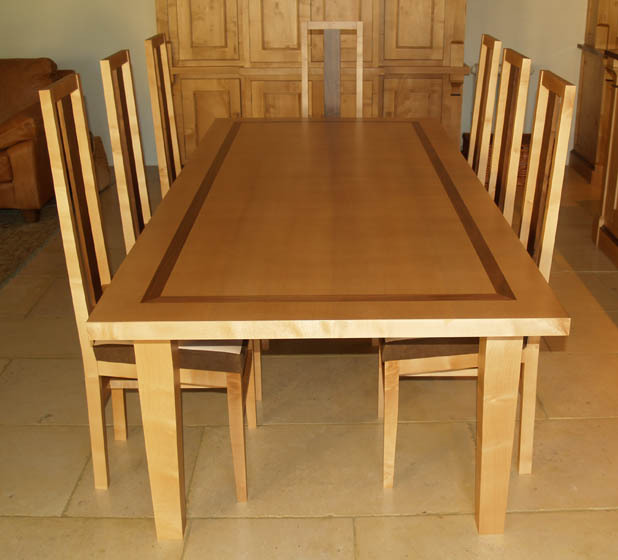 A fantastic Cromwellian plank top refrectory table with chairs to match. 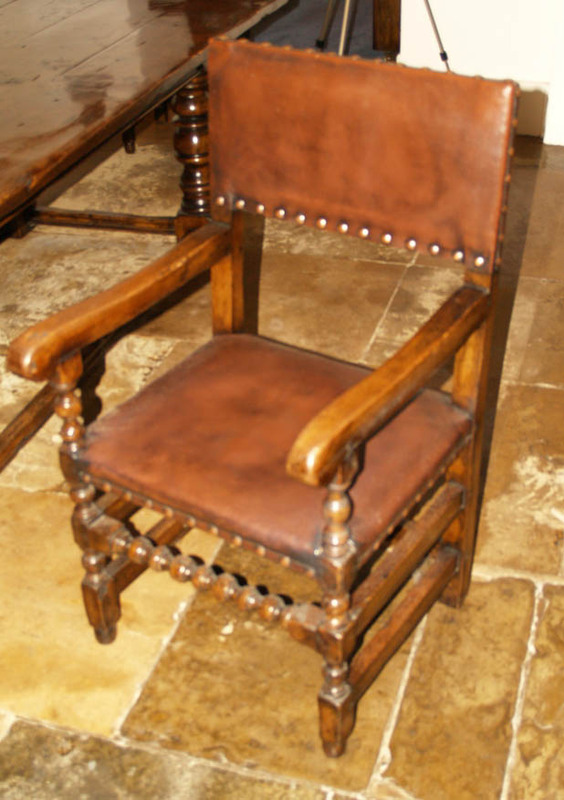 Based on an original pattern, these chairs included bobbin turned stretchers and antiqued leather seats and backs, all of which finished with large copper studs, typical of the period. 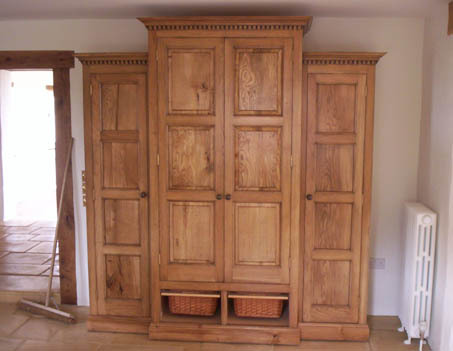 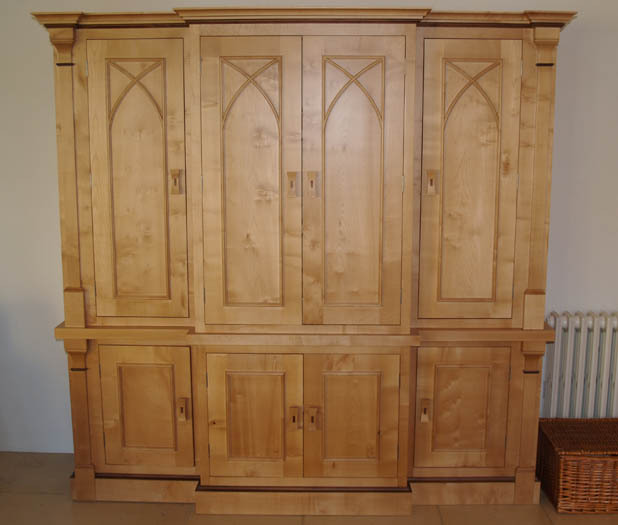 A beautiful Oak court cupboard made to fit an alcove. 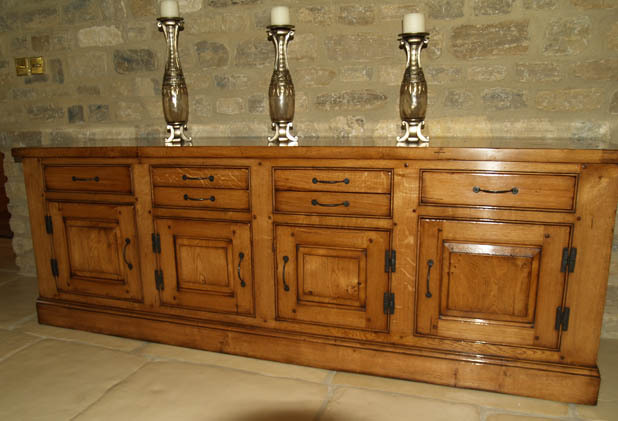 This Georgian styled oak sideboard offers fantastic storage options. 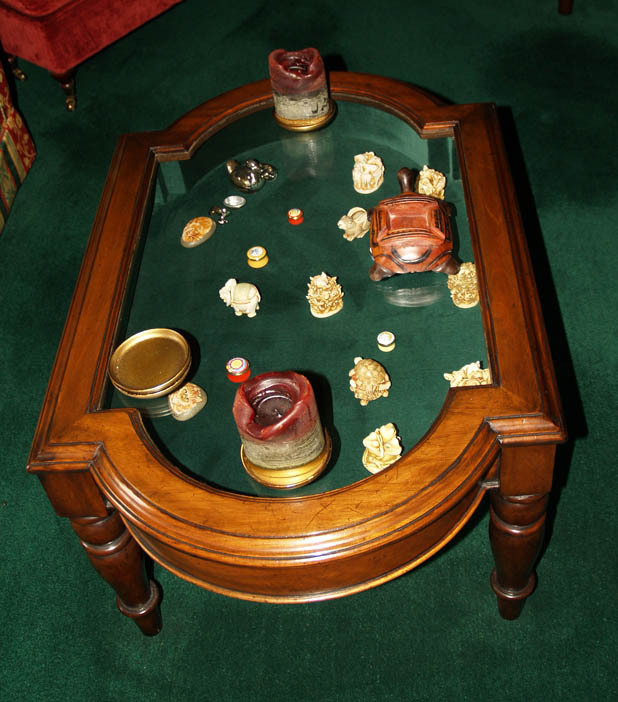 If there was such a thing as a Georgian coffee table - this piece may have met the criteria with its planked oak top and pot-board. 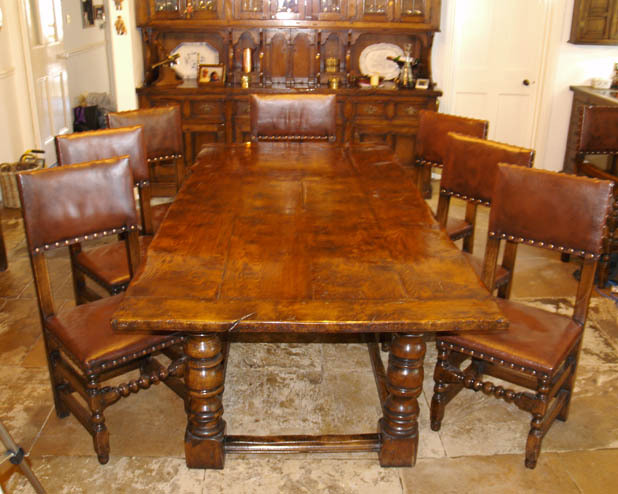 An amazing Regency 'D' end dining table in four sections crafted beautifully from figured Mahogany. 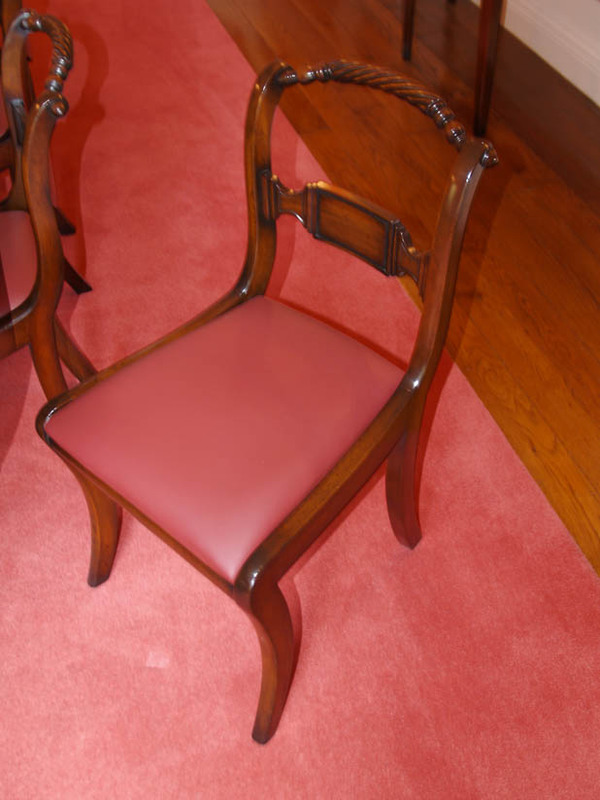 This suite seated 12 on elegant, matching, rope back chairs. 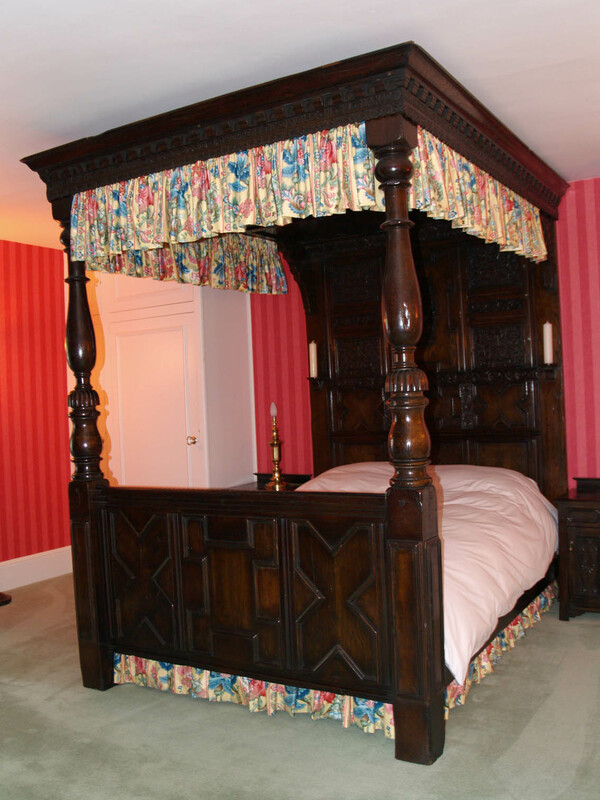 A stunning four-poster bedroom suite. 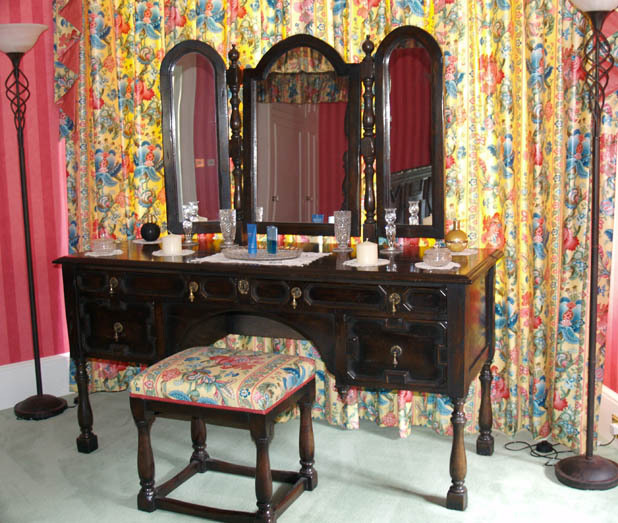 Items such as this dressing table can finish-off the look of a bedroom suite. 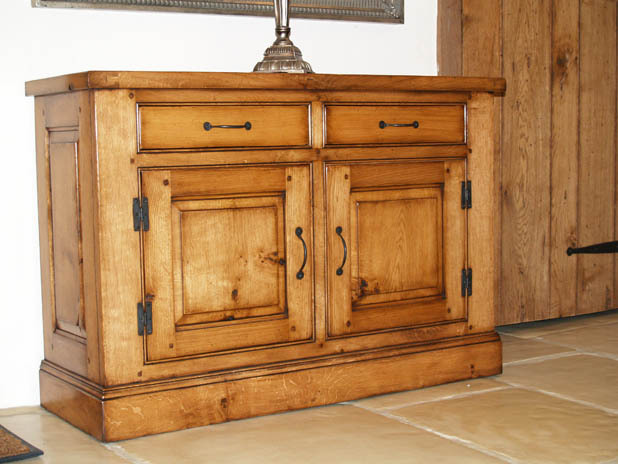 This chest was made in 2005 and is testament to our ability to create an authentic, period look. 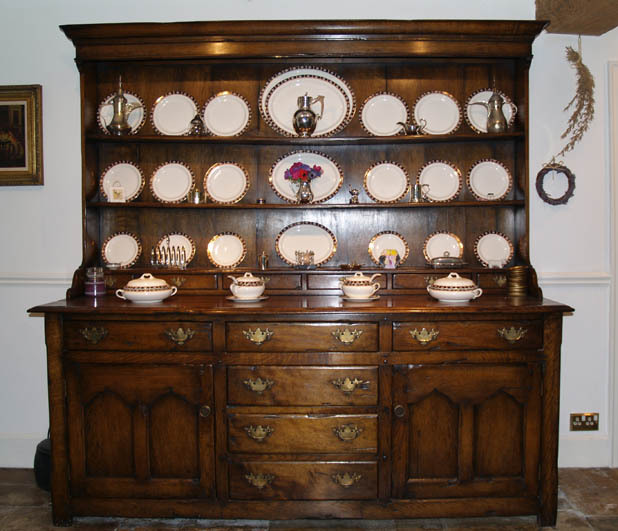 A fantastic copy of an original Oak dresser. 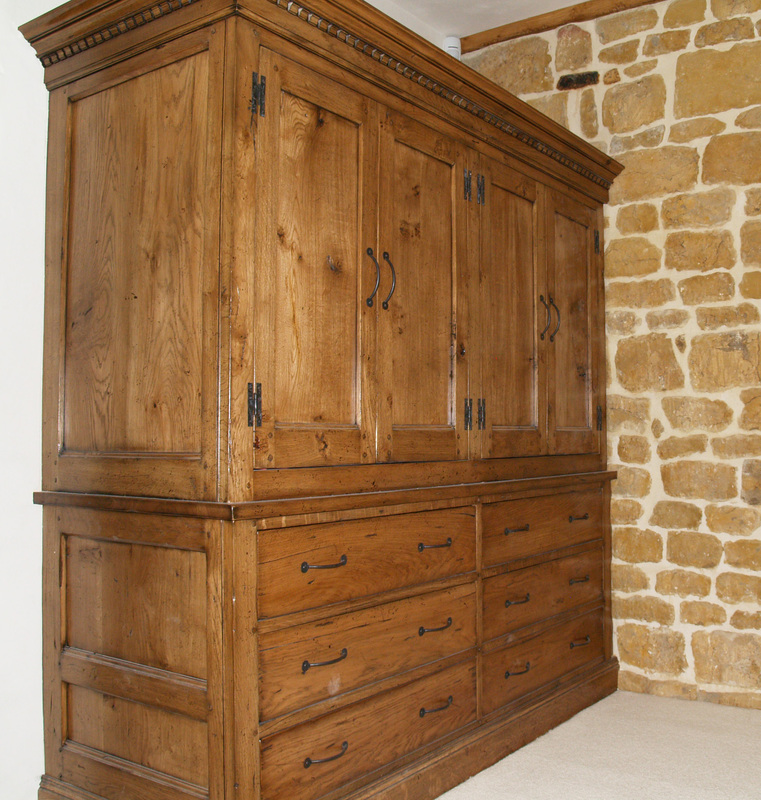 A dresser in reclaimed pine. 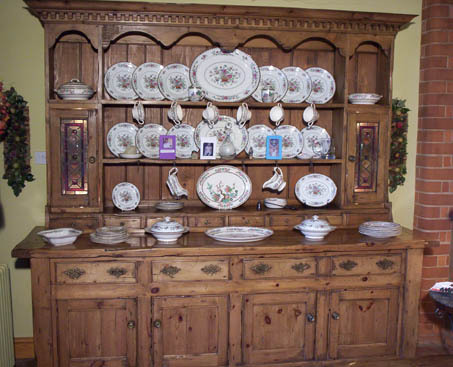 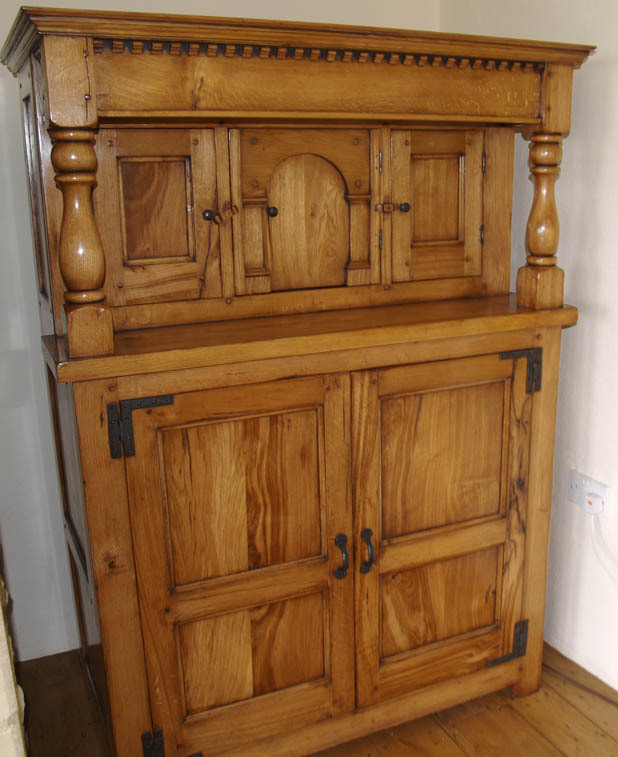 A panelled Oak "House keeper" (larder and more). 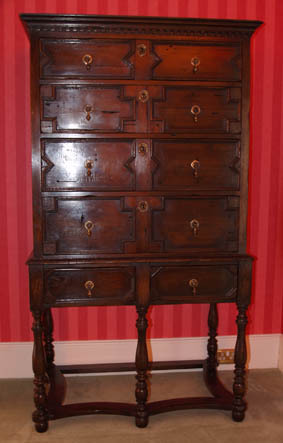 A beautiful "break-fronted" cabinet in the Biedermiere style from Sycamore with contrasting Black Walnut detailing. 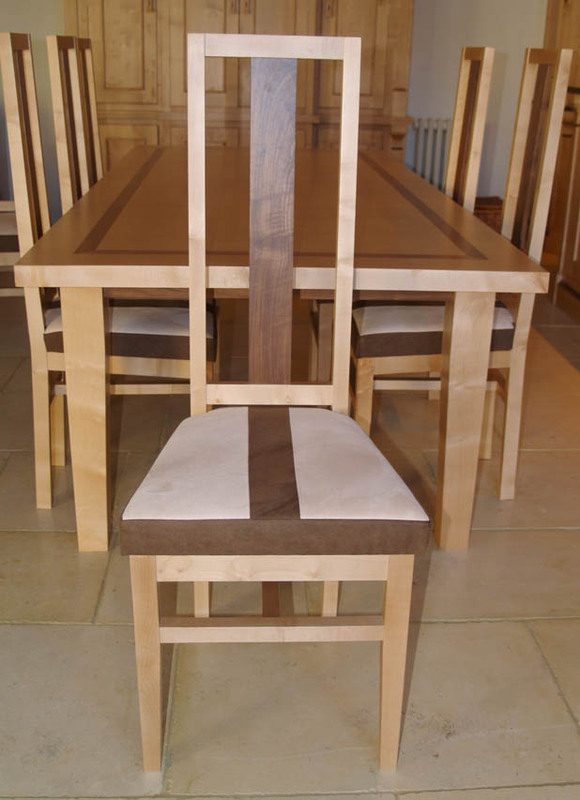 Sycamore table and chairs with black Walnut. 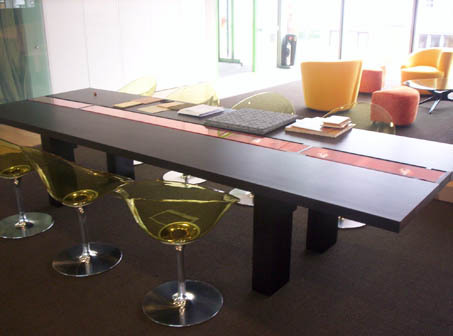 Our Biedermiere style reflected in upholstered suede seats with contrasting light and dark fabric. 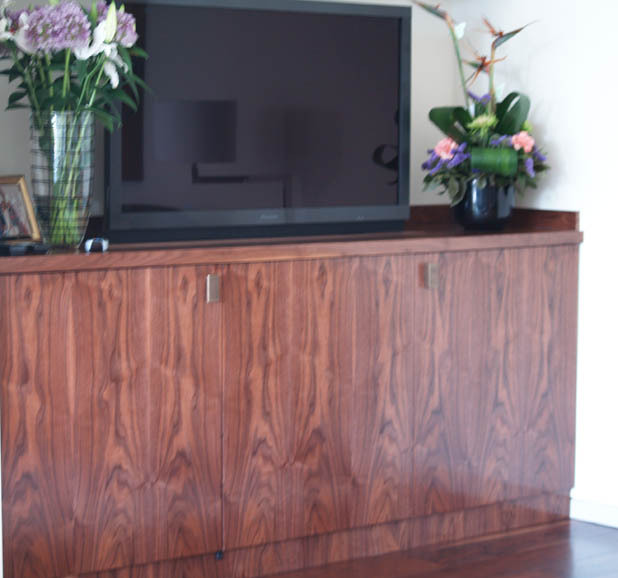 A well figured and book-matched Black Walnut cabinet with remote controlled rise and fall TV. 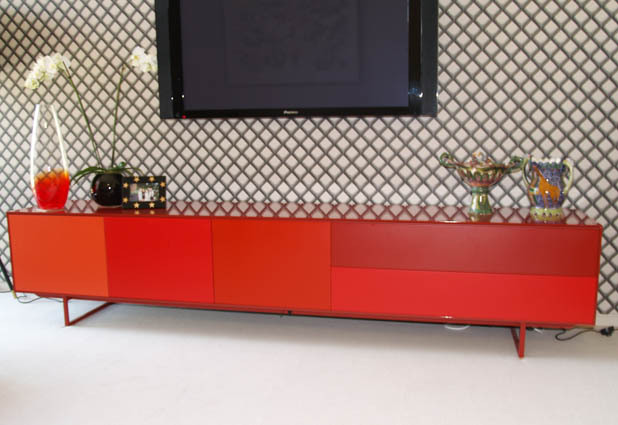 This low side cabinet featured various degrees of colour from the same pallette in a gloss lacquered finish. 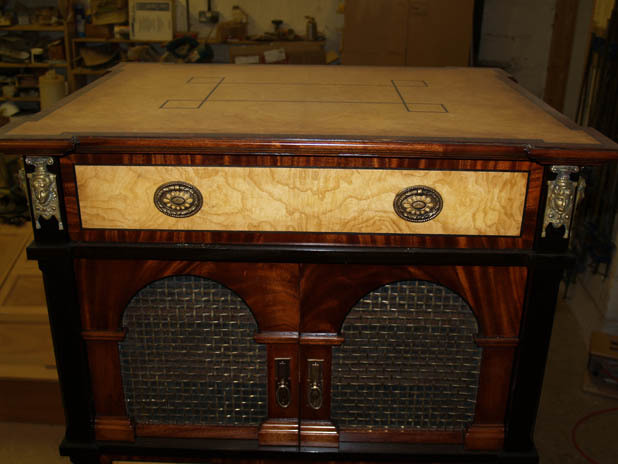 A velvet lined coffee table/display cabinet in classic Victorian styling. 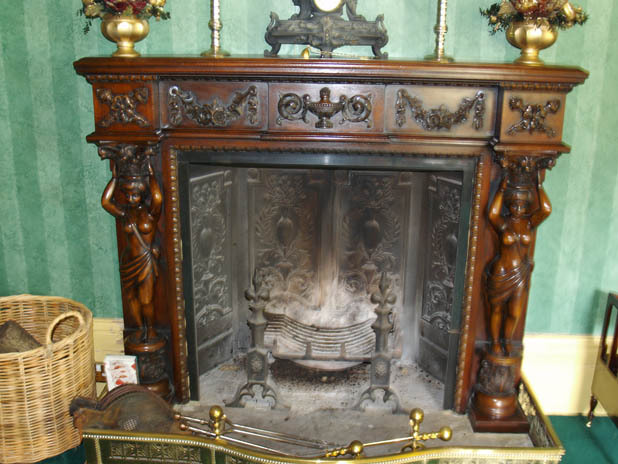 A hand carved Mahogany fire surround. 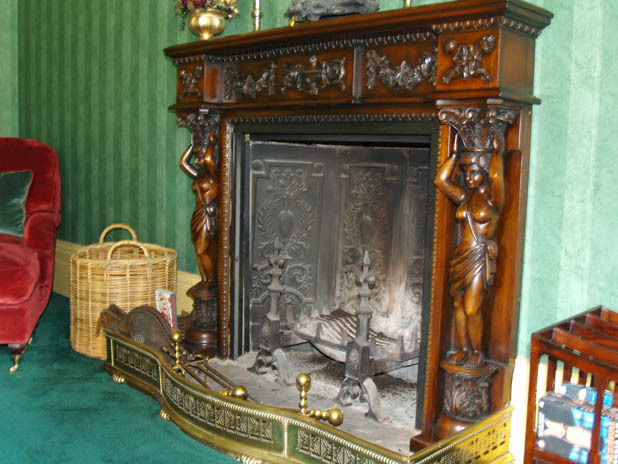 Cast iron back panels, fire dogs and basket and brass fender where all sourced by us to complete the Victorian look. 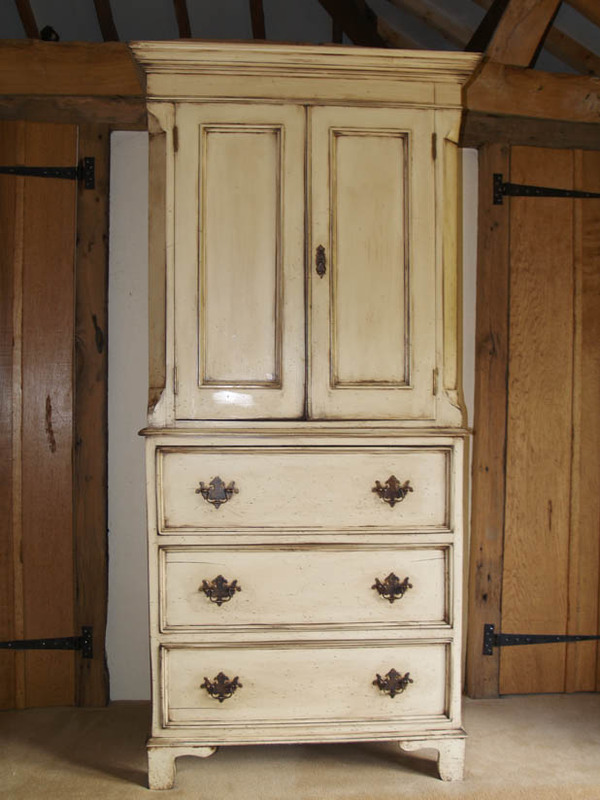 An individual, antique painted bedroom piece. 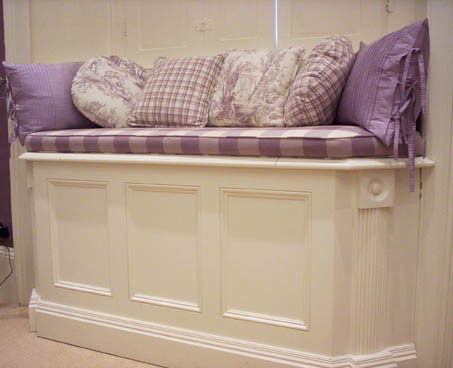 A typical bedroom window seat. 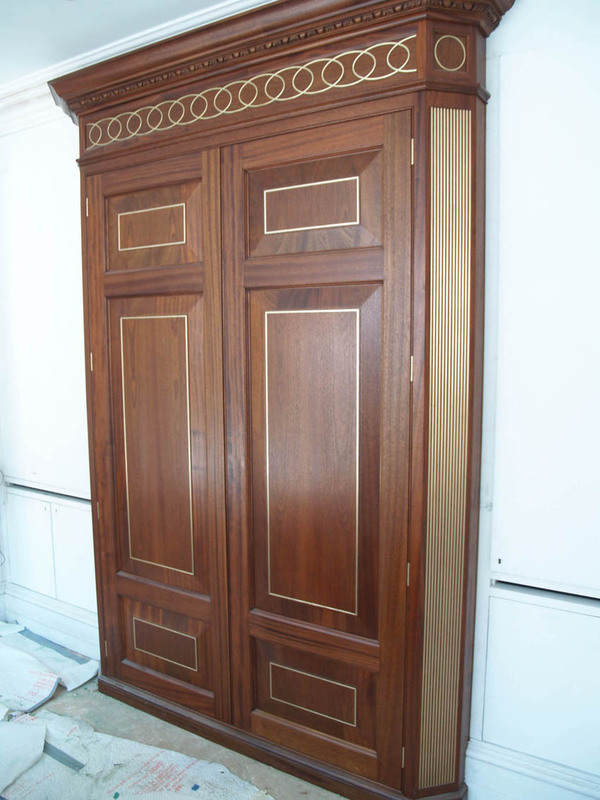 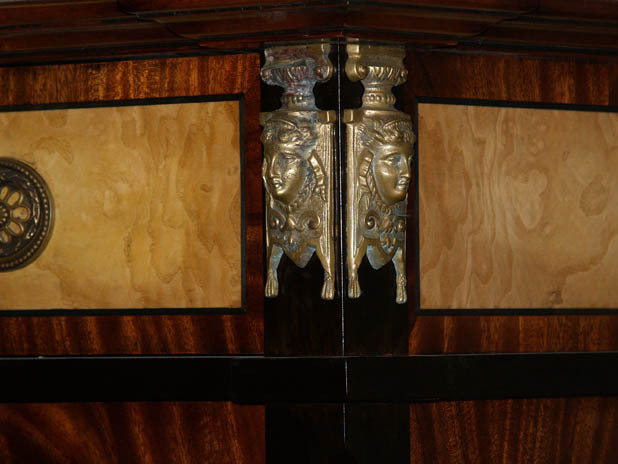 A unique brass inlaid, Mahogany Armoire in the Empire style. 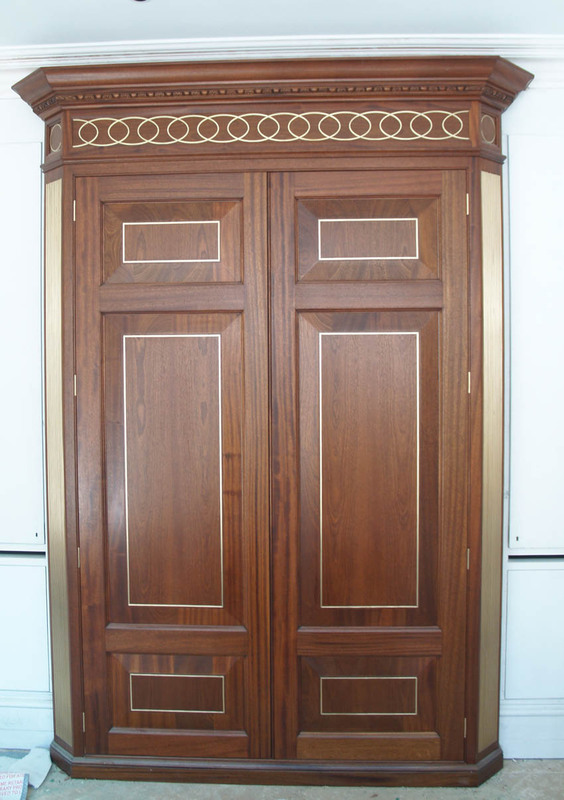 A huge "raised and fielded" detail created two fantastic doors. 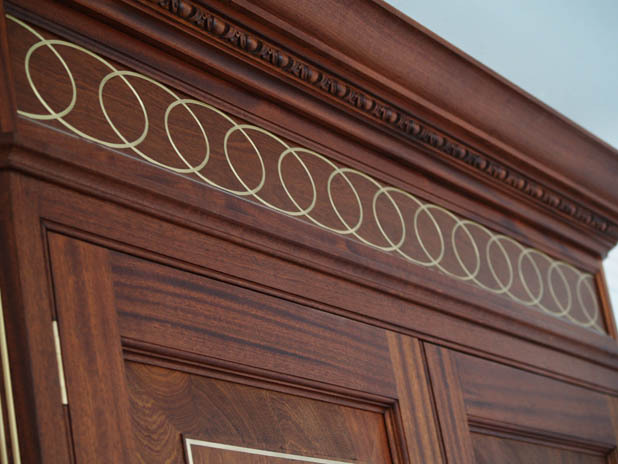 Intricate brass inlay to a frieze panel. 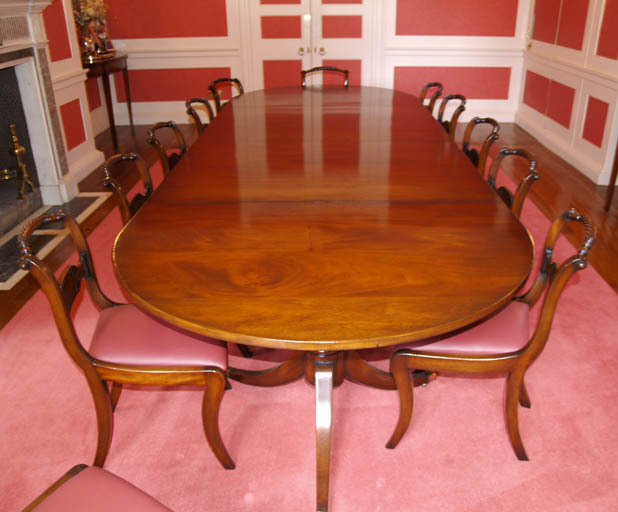 A contemporary boardroom table in dark Walnut. 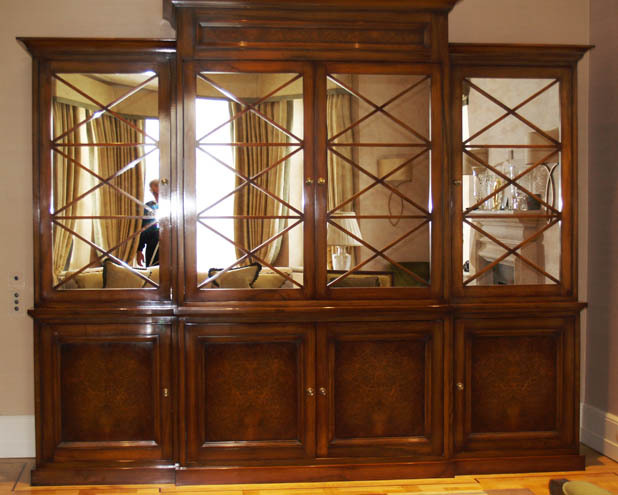 A beautiful mirror fronted Television and drinks Cabinet in Burr Walnut. 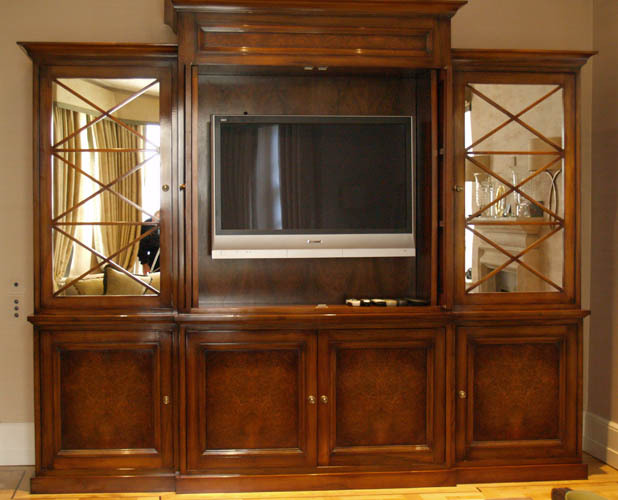 Pocketing doors conceal a Television. 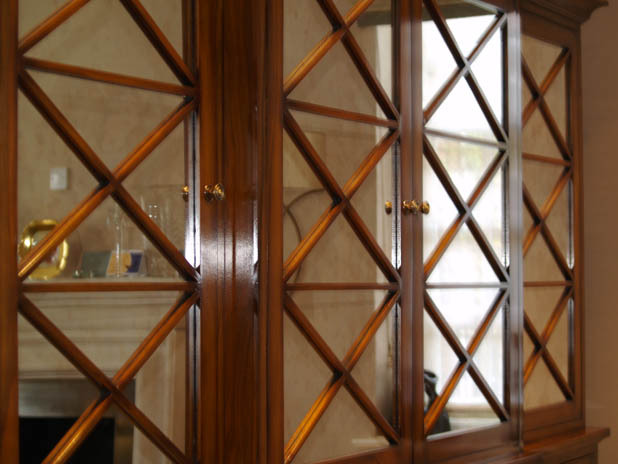 Mirrored doors with fine glazing bars. 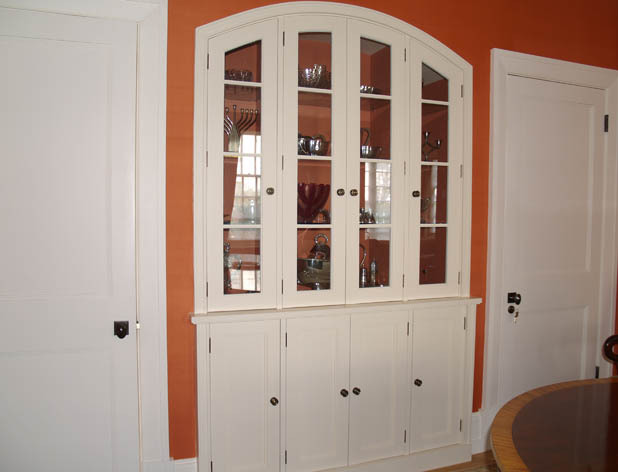 An elegant glazed cabinet with Georgian styling to fit an alcove. 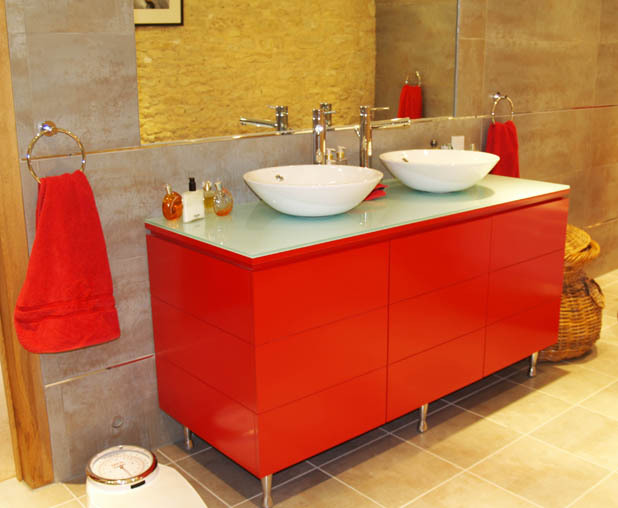 A gloss lacquered contemporary bathroom cabinet with opaque glass top.